This name uses Spanish naming customs: the first or paternal family name is Ruiz and the second or maternal family name is Gutiérrez. Carlos Humberto Ruiz Gutiérrez (born 15 September 1979), initially nicknamed El Pescadito ("The Little Fish") but gradually known as just Pescado or "Fish" (even by Spanish-speakers), is a retired Guatemalan footballer. A product of CSD Municipal's youth academy, Ruiz has played for five MLS clubs (Los Angeles Galaxy, FC Dallas, Toronto FC, Philadelphia Union, and D.C. United), scoring 88 goals in 182 MLS regular-season matches and 16 goals in the post-season, which is the record for the most post-season goals in MLS history. In 2002, he was named the MLS's Most Valuable Player of the season. He was a member of the Guatemalan national team from 1998 to 2016. He is regarded to be the greatest Guatemalan player of all time. He served as the national team captain, is the player with most caps, and is the all-time top scorer. He played in five World Cup qualification competitions, and in September 2016 he became the all-time top scorer in World Cup qualifiers, with 39 goals. Ruiz, born in Guatemala City, Guatemala, started his footballing career in local club San Carlos. At the age of 12, he joined the youth divisions of Club Social y Deportivo CSD Municipal, and at 16, he made his professional debut. He became a starter for Municipal and a young star in the Guatemalan league until 2000, when he traveled to Europe to play for a short time alongside compatriot Guillermo Ramírez at Greek club PAS Giannina. After a stint with PAS, he returned to Municipal. Ruiz playing for Los Angeles Galaxy. In January 2002, Ruiz signed with the Los Angeles Galaxy. He was initially skeptical, telling The New York Times, "I didn't know anything about MLS or soccer in the U.S. Everything we hear about Major League Soccer is not so good ... we hear that all the players come here to finish their careers." However, he found the level to be better than he imagined, saying: "In the beginning, I was not happy to come here. But after a couple of games and when I see the level of soccer here, I was excited to play here." Once in MLS, Ruiz shone immediately. In his debut season in 2002, Ruiz scored 24 goals (winning the MLS Golden Boot), leading the Galaxy to the MLS Cup by scoring the only golden goal in MLS Cup history. He was named the MLS Most Valuable Player that year. In the playoffs, he scored eight goals and added two assists, totaling 18 points and setting an MLS record for goals and points in a single postseason. Ruiz' overtime goal in extra time of MLS Cup 2002 gave Galaxy the title. In his second season, Ruiz cooled off significantly, but the forward still finished the season tied with Taylor Twellman for the league lead in goals with 15. He continued to statistically drop in 2004, scoring 11 goals. Ruiz had trials at English side Wolverhampton Wanderers in the 2003–04 season. In 2005, when Landon Donovan expressed his desire to return to MLS, the Galaxy traded Ruiz to FC Dallas for the #1 allocation in the MLS pecking order, so that they could acquire Donovan. Ruiz finished his first year in Dallas with 11 goals and two assists. During the postseason in the conference semifinals, Ruiz scored two goals in the second leg match against the Colorado Rapids, but FC Dallas were eliminated on penalty kicks. In February 2006, MLS fully bought Ruiz's contract rights from his former club, Municipal, and FC Dallas was able to negotiate a multi-year deal. In March 2006, a bicycle kick goal he scored against D.C. United was selected as the "Goal of the Decade" in MLS through online voting. 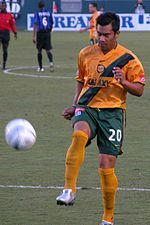 During a 2007 game against the Houston Dynamo, Ruiz was involved in a controversial incident with Houston midfielder Ricardo Clark. Following a corner kick in which the two players became entangled, Clark violently kicked Ruiz in the upper body as he lay on the pitch hoping to draw a foul. Ruiz then hit Clark's back with his knee during the subsequent play, and both players were sent off, with Clark also receiving the longest suspension in league history. Following the conclusion of the 2007 season, Ruiz appeared to be unwilling to return to Dallas and to be holding out for a move back to the Galaxy. Earlier attempts to produce a trade faltered due to Ruiz being a grandfathered Designated Player, with the Galaxy already having other players in the same situation (Landon Donovan and David Beckham). In January 2008, FC Dallas traded Ruiz to the Galaxy for an undisclosed cash allocation and the Galaxy's natural second-round pick in the following year's MLS SuperDraft. At his departure, he said, "I did everything I could to win a championship with Dallas. Unfortunately, it did not happen." He spoke about the Galaxy to ESPN analyst Andrea Canales: "I still think the Galaxy is the best team in the U.S. They're the best organization. The Galaxy have always had famous players. They continue to be a team that people always follow," and added his personal relief to be on the Galaxy team, "I'm so glad I came to the Galaxy and not another team, because I would have felt like I was starting over." In the season opener, however, Ruiz suffered a knee injury and was unable to play for over a month. While Ruiz was injured, the Galaxy found unexpected striking potential in Edson Buddle, and even after coming back from the injury, Ruiz was notably still left off the travel roster for a high-profile game against D.C. United. He scored his first goal of the 2008 season on 19 July in a game against New York Red Bulls. Ruiz was traded on 19 August 2008 to Toronto FC who in-turn released Laurent Robert to make room for Ruiz. He was expected to help solve TFC's goal scoring woes as he had scored 82 goals in MLS at that point in his career, but he managed only five first team games in Toronto, during which he scored no goals. He was released by Toronto in early 2009 after they signed Dwayne De Rosario. On 31 January 2009, Ruiz signed a contract with Paraguayan club Olimpia Asunción under the request of then-coach Ever Hugo Almeida. He scored 10 goals and was a fan favourite. One of his most memorable goals was against Cerro Porteño in the derby which Olimpia won 2–0. He also scored a hat trick against Rubio Ñu in a 5–3 victory for Olimpia. Ruiz signed with Puebla on 30 June 2009 under head coach José Luis Sánchez Solá. On 25 July 2009, in a game against Tigres, he scored his first goal for Puebla on a penalty kick. He wore number 20, which is the same number he previously wore for LA Galaxy, FC Dallas, and the Guatemala national team. Ruiz agreed to join Aris FC on 12 July 2010. He made his debut on 18 August 2010 in the playoff round of the Europa League against Austria Wien, becoming the first Guatemalan footballer ever to appear in a UEFA competition match. The first leg was played in Thessaloniki with Ruiz netting on his debut to give Aris a 1–0 victory. In the second leg played in Vienna, Ruiz scored again in a 1–1 draw, giving Aris a 2–1 aggregate victory and sending them through to the group stage, where he scored one more goal against Rosenborg. After trialling with the club during the 2011 MLS pre-season, Ruiz signed with the Philadelphia Union on 22 February 2011. On 26 March he scored Philadelphia's winning goal in the home opener of the 2011 MLS season against the Vancouver Whitecaps FC. Ruiz also scored the "MLS Goal of the Week" in Week 10 of the season with a game-winning 35 yard strike against the Chicago Fire. On 3 August 2011, Ruíz was transferred to Tiburones Rojos de Veracruz. He scored his first goal for the club against Correcaminos during the 4th week of the 2011 Apertura tournament and finished the year with six goals in five matches. Ruiz remained a part of the club until 2013, though he was inactive for nearly a year. On 31 January 2013, Municipal announced that Ruiz would be rejoining the club. However, this move was cancelled after Veracruz refused to terminate Ruiz's contract. On 20 February 2013, DC United announced that the club had signed Ruiz via the MLS allocation process to a one-year deal. On 30 October 2013, DC United announced that they had declined the contract option on Ruiz. On 8 February 2014, Municipal announced that Ruiz would be rejoining the club. He signed an 18-month contract that made him the highest paid footballer ever in Central America. On 15 September 2016 (the roster freeze date for that season), FC Dallas announced that they had signed Ruiz for a second stint with the club. Overall, Ruiz has earned 132 caps and has scored 68 goals for his country. He has played in World Cup qualification campaigns for the FIFA World Cups of 2002, 2006, 2010, 2014, and 2018. He played his first international match on 11 November 1998, a friendly against Mexico, and scored his first goal against El Salvador at the 1999 UNCAF Nations Cup. In 2000, as the Guatemala national futsal team had begun its development, Ruiz was selected, along with other 11-a-side football players, as part of the squad that competed at the 2000 Futsal World Championship, hosted by Guatemala. He scored one goal in the tournament. After scoring eight goals in nine matches during the 2002 World Cup qualification campaign and already having a successful career in the MLS, Ruiz was the focal point of the Guatemalan team in qualifying for the 2006 FIFA World Cup, leading the team in scoring as they reached the final stage of the CONCACAF region. However, they would not qualify for the World Cup. On 14 June 2008, Ruiz broke Juan Carlos Plata's all-time individual goal-scoring record for Guatemala by scoring four goals against Saint Lucia in Guatemala's 2010 World Cup qualification opening match. Ruiz had scored 39 goals, four more than Plata's total. Ruiz also became the first Guatemalan player to score four goals in a World Cup qualification match. On 10 September 2008, Ruiz scored two goals against Cuba in Guatemala's 2010 World Cup qualification in the 3rd match of the 3rd round of qualification of the CONCACAF region. Those two goals extended his all-time individual scoring record for Guatemala to 41 goals, six more than Plata's total. On 9 February 2009, Ruiz announced his retirement from international football. However, on 4 January 2011, he stated that he was returning to international football, making the UNCAF 2011 championship to be held in Panama his first international tournament in two years. He then participated in the 2011 CONCACAF Gold Cup, scoring one goal against Grenada in the first round and another one against Mexico in the quarterfinals in a 2–1 defeat. On 16 October 2012, Ruiz again announced his retirement from international competition after a 3–1 loss to the United States at Livestrong Sporting Park, which eliminated Guatemala from 2014 World Cup qualification. However, he would return to play for Guatemala again and became the second Guatemalan player to appear in five World Cup qualification processes (Juan Manuel Funes being the first) when he started in the second round of the 2018 World Cup qualification in their opening match against Bermuda. On September 6, 2016, Ruiz scored 5 goals against Saint Vincent and the Grenadines in his final farewell match for Guatemala giving him a total of 39 goals in 47 qualifying games, which makes him the highest goalscorer of all-time in FIFA World Cup qualification history. Ruiz is the most prolific goal-scorer in the history of the Guatemalan National Team with 68 goals in 132 matches. Ruiz is currently the 11th all-time leading goal scorer in MLS history. He is also the All-Time Leading Goal Scorer in MLS Playoff history with 16 goals in 17 games. He was also a nominee for the 2011 MLS All-Star Game. ^ "Carlos Ruiz". Carlos Ruiz. MLSsoccer.com. Retrieved 15 September 2016. ^ "Carlos "el pescado" Ruiz". deguate.com. ^ Marcus, Maria (28 March 2008). "Little Fish in an Increasingly Competitive Pond". The New York Times Goal Blog. Retrieved 12 May 2008. ^ "Player bio". mlsnet.com, Major League Soccer. Archived from the original on 3 November 2006. Retrieved 24 November 2006. ^ Ricardo Clark kicks Carlos Ruiz. YouTube. 1 October 2007. ^ Aparicio, Diego (15 January 2008). "FC Dallas trades Carlos Ruiz to LA Galaxy". The Dallas Morning News. Retrieved 11 May 2008. ^ Canales, Andrea (13 March 2008). "The Return of Ruiz". soccer365.com. Archived from the original on 14 May 2008. Retrieved 18 May 2008. ^ "Carlos Ruiz undergoes knee surgery". PA Wire Services. 1 April 2008. Archived from the original on 6 April 2008. Retrieved 18 May 2008. ^ "Latest Football News, Transfer Rumours & More". Goal.com. ^ "Union Sign Forward Carlos Ruiz". Philadelphia Union. ^ "Ruiz's wonder goal easily wins AT&T Goal of the Week". Philadelphia Union. ^ "Report: Ruiz signs multi-year deal with Mexico's Veracruz". MLSsoccer.com. ^ "Estadísticas Veracruz – ESPN Deportes". go.com. ^ "El internacional Carlos 'Pescadito' Ruiz ya no jugará con el Municipal de Guatemala". univision.com. Archived from the original on 21 May 2013. ^ Ben Bromley. "D.C. United signs Carlos Ruiz through the allocation process". Black And Red United. ^ "DC United decline contract options for Carlos Ruiz, Lionard Pajoy and Marcelo Saragosa". mlssoccer.com. 30 October 2013. ^ "FC Dallas Signs Forward Carlos Ruiz". FC Dallas Signs Forward Carlos Ruiz. FCDallas.com. 15 September 2016. Retrieved 15 September 2016. ^ "Guatemala". FIFA. Retrieved 9 October 2018. ^ "Prensa Libre – Periódico líder de Guatemala". Prensa Libre. ^ "Carlos Humberto Ruiz - Century of International Appearances". www.rsssf.com.